Since the advent of Ravelry, I have found posting to my blog is getting neglected. Badly neglected. I do hope that will change now. I have altered the settings on my blog too - I found I had it set to moderate comments - and that is changed. Just recently I have been getting addicted to a delightful pattern by Muriela - the Baby Kina. 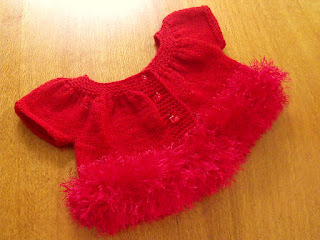 I discovered that Muriela has a myriad of the most gorgeous baby patterns on Ravelry and on her website Kids Tricot. As I am on a limited budget, I shall have to save up to buy some more of her patterns - not that they are expensive, but there are so many that I want! I do urge you to take a look at her designs - they are stunningly simple, very French, therefore tres chic! And top down too - what else could a knitter of baby clothes ask for? The basic pattern is so adorable - however, I ran out of the beautiful red yarn before I had reached the bottom of the body section - so I used some Moda Vera Jazz to finish it off - and I am in love with the result!! There are several versions of this pattern. Baby Kina, Kina for older kids, and one with long sleeves and a Lady Kina for adults too. I don't know how to put a link on here so you can just click on it and go straight to the pattern. But here is the link to her 114 designs on Ravelry http://www.ravelry.com/designers/muriela Prepare to be gobsmacked! I have more Baby Kinas finished except for sewing on of buttons, so watch this space for more pics.